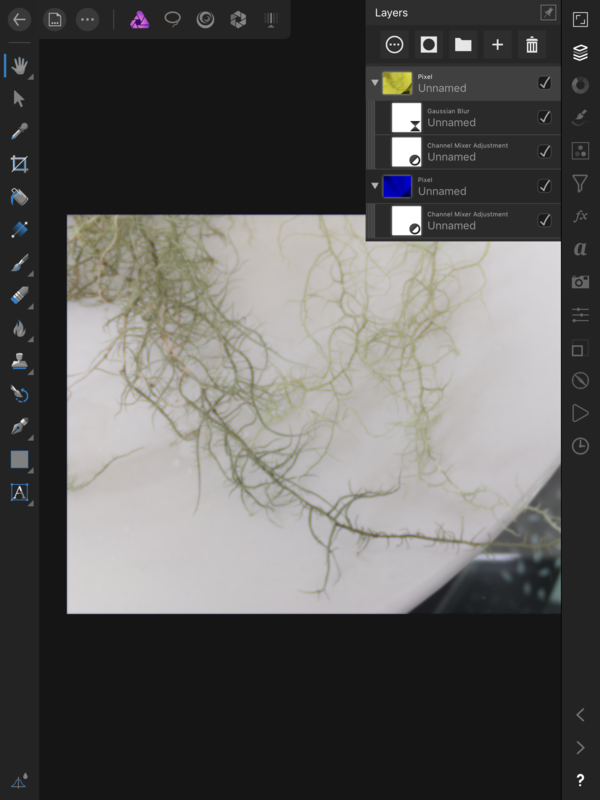 I've been looking all through Affinity Photo for Ipad and I can't find a way to isolate channels on one layer only. In Photoshop there are advanced blending modes where you can select which channels are visible on each layer. 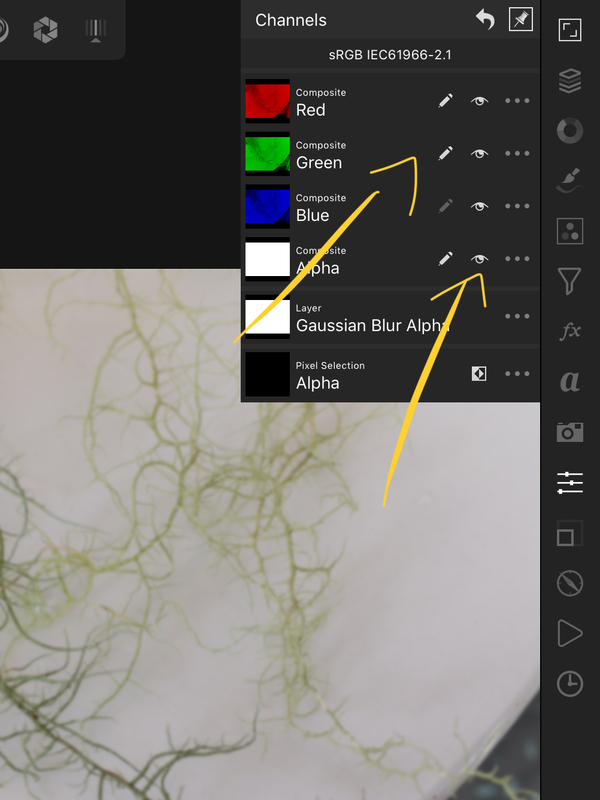 So you can have the red and green channels visible on one layer but not the blue, and so on. Please note the blend mode selected in the example is "Normal". I'm looking for information on isolating channels, not blend modes. Is there the ability to isolate channels on each layer available in Affinity Photo? I just discovered the Curves adjustment, which seems to isolate channels on layers. Looks like my problem is solved. You can save channels as greyscale layers, then with blend those. If I understand your question? Hi Stanley, thank you for your reply and suggestion. I was able to make a composite image from all three different channel greyscale layers and then apply the curves adjustment to create a full colour composite, true to the original image. I followed the tutorial and created a duplicate background layer. I then added a curves adjustment so I could see the blue channel only on this duplicate layer. When I added a Gaussian blur to this blue layer it gave me a blue tint. So this obviously wasn't the right way to do it. Next, starting over with just the original image, I created a greyscale layer from the blue channel, added a Gaussian blur to this greyscale blue layer, and shuffled through all of the different blend modes. None gave me original picture, just with a blur attached to the blue layer/channel. Third time, starting over, I created three greyscale layers; red, green and blue, from the original colour image. I then added a curves adjustment to each layer, so each layer would represent either red, green or blue. Everything is fine so far, the composite greyscale layers with curves adjustment look just like the original image when using the "lighten" blend mode. I then added a Gaussian blur to the blue layer (as the tutorial states to do) however it tinted the blue layer with yellow. I'm not sure it is possible to recreate this with Affinity Photo. Clicking in the 'edit icon' will toggle it on or off. Disabling it for a specific channel will prevent changes to that channel. Similarly, the 'eye icon' will allow you to toggle channel visibility. Sorry, I misunderstood your question! Thank you for taking the time to reply. Unfortunately using the channel mixer and the Gaussian blur on the blue channel/layer gives a yellow tint to that layer - exactly like the third time I tried, as described above. Photoshop has advanced blending modes where you can select each channel on and off for each layer (so you can have either one, two or three channels selected in one layer. Please see the attachment for what this looks like. 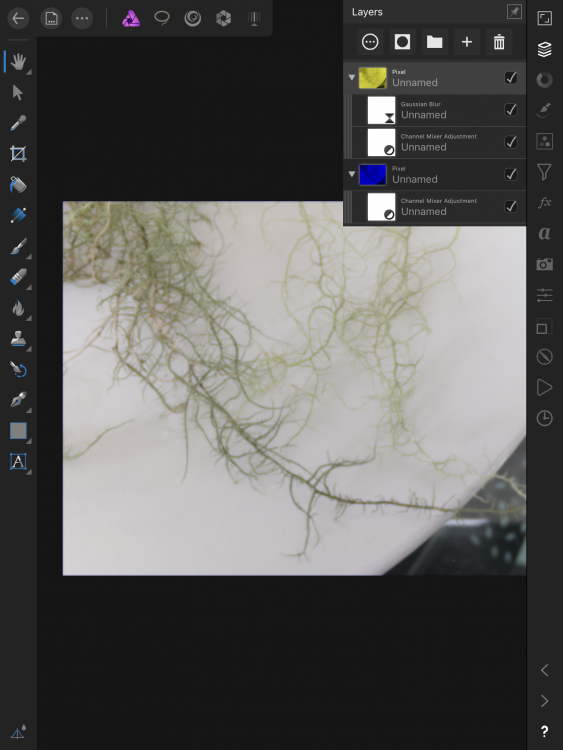 It seems to be missing from Affinity Photo, as I cannot recreate the second Photoshop tutorial in Affinity Photo (from above). Photoshop has Curves and a Channel mixer too, however they also have advanced blending of channels, which seem to do different things. Here are a couple of other threads on this forum that are talking about the same thing. Actually, to take care of that yellow tint, I had a duplicate layer with only the blue channel. Using blend mode as lighten makes it look like the original image. Not sure if the blur will act the same in a blend mode though. Then I guess you could group these two layers. If that doesn't make sense, please disregard. I'm a noob. Nevermind, I see the yellow tint with the blur! Think you can do all the steps in that face retouching tutorial in AP, but I wouldn't. I think there are now better ways to do those steps, for example for noise use Noise Reduction, to blur the flat areas of the face use Bilateral Blur. In Dan Margulis's book 'Photoshop LAB color' he gives a simple way of enhancing faces that I think gives a better result than that tutorial. To get rid of the yellow tint when you blur the B channel, blend the original layer with the layer with the blurred B in colour mode (you'll see the yellow tint) then use the controls in the bottom third of the layer options window: tap Master, select Red and Green in turn and for each, in the box on the bottom left, drag the horizontal line from the top of the box to the bottom. This selects the R and G from the original. Apparently blurring the B changes the R and G slightly; I'm not sure why. Hi Stanley, thanks a lot for your help. I appreciate the time you have taken to look through everything. I don't seem to be able to reproduce what you have done, however I will keep trying in AP with your instructions. If you could do a point by point, from the very start, that would be great, however I understand if you don't have time. I'm not sure how many layers you have and how you got the blue layer. Is your blue layer a grey scale layer of the blue channel (of the original image) with a curves adjustment on it? Or did you just clear the red and green channels from a duplicate of the original layer? Did you put the blue layer above the original layer? Or the original layer above the blue layer? I tried both ways (original layer above the blue layer, and blue layer above the original layer) and couldn't get it to work. After changing the blend mode to "colour", when I drag down on the red and green lines in the source box on the original layer, the layer disappears; same for when I do it on the blue layer. Really not sure what I am doing wrong, albeit I am very new to this program. I'm truly sorry for any misunderstanding. Hi, my bottom layer was the original. To create the second layer I duplicated it, went to the channels studio and tapped composite blue to just display the B, then tapped the filter studio and applied a Gaussian blur - this is applied to the visible channel only of the second layer, B. Then in channels studio I tapped the return arrow at the top to display all channels again. I then changed the layer 2 blend mode to colour and saw the yellow tint. Which I got rid of with Blend ranges as I described above. You seem to be turning an RGB image into a single channel by adjusting the curves to zero the unwanted channels. This doesn't seem a useful thing to do. But I repeat, don't follow that tutorial. Hi Stanley, thanks so much for all of your help and patience. I finally got it in the end. I really appreciate your help; knowledge for the future.